Great that you saw so many birds too. That’s another benefit of cycling. You see so much more wildlife than you do from a car. Loved the happy smiles and the great pics. That bike rack is very cool. 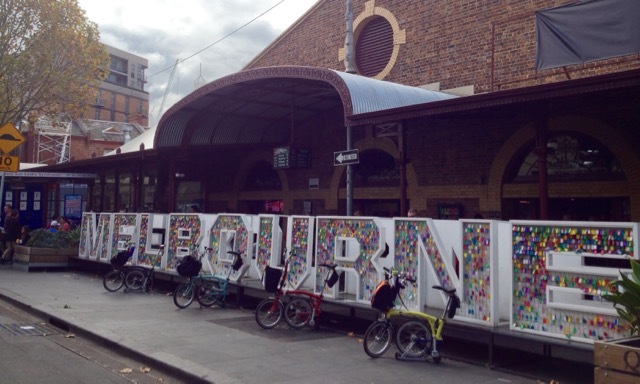 Super panoramic shot of the cycles against the Melbourne sign. 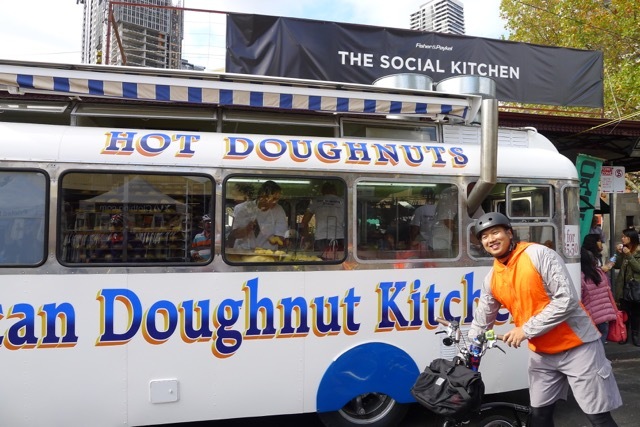 Jane, if you visit Melbourne I’ll figure something out for you! And yes, Stanley did a fantastic job with his panoramic photo! It looks like you all had a great time. 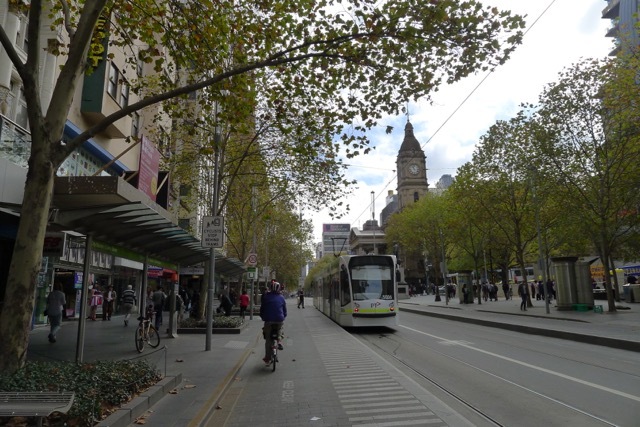 I liked seeing your photos of a few of the well known tourist spots – makes me want to get back to Melbourne for a few days again 🙂 And as for the guy who laughed at you, I agree with Jane – what cheek! We certainly did have a great day. It was lots of fun taking photos of the bikes in front of various well known spots. Plenty more to bag. All I can say about the ‘cheeky’ bloke is that at least it wasn’t a nasty laugh. He really did find something very amusing. I was bamboozled more than insulted. 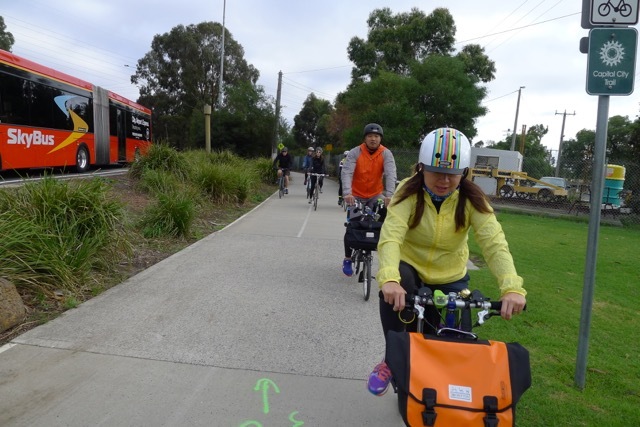 Cycling around traffic – let alone through the city! 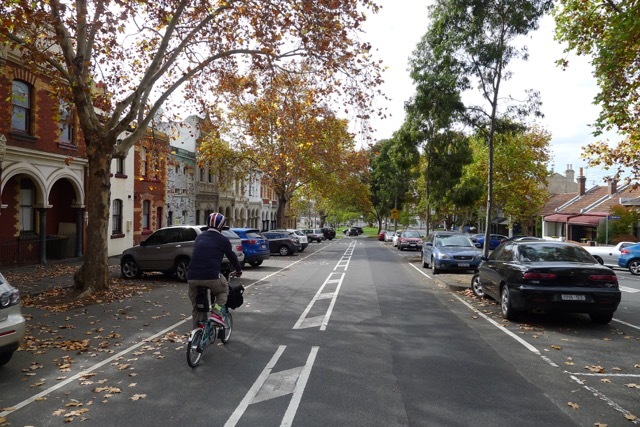 – is one reason I didn’t rush to bring or buy a bike when I moved down. It can be really scary! But riding in a group helped. I’m not at all surprised you haven’t heard of Bromptons previously. I only found out about them about just over a year ago! They are absolutely fantastic, however. 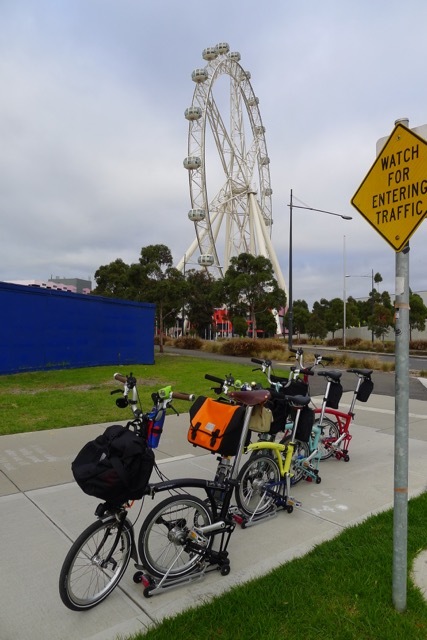 If you’re interested, I shared the story of how I came to be a Brompton enthusiast in my last post: Ticket To Ride (http://wp.me/p3eAz6-1hq). 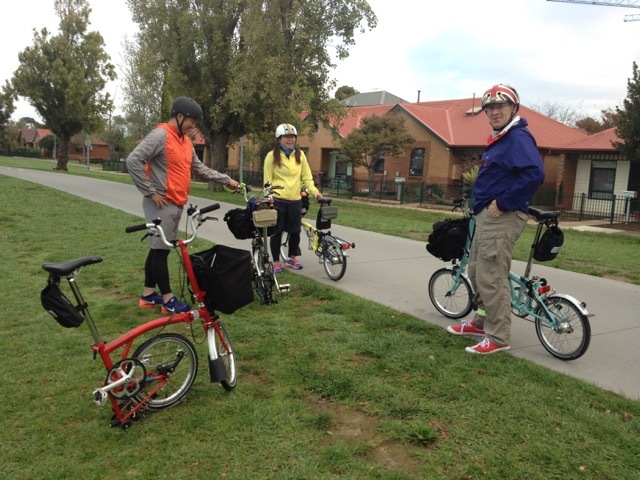 Hi Dayna, enjoyed reading about your inaugural Brompton excursion. 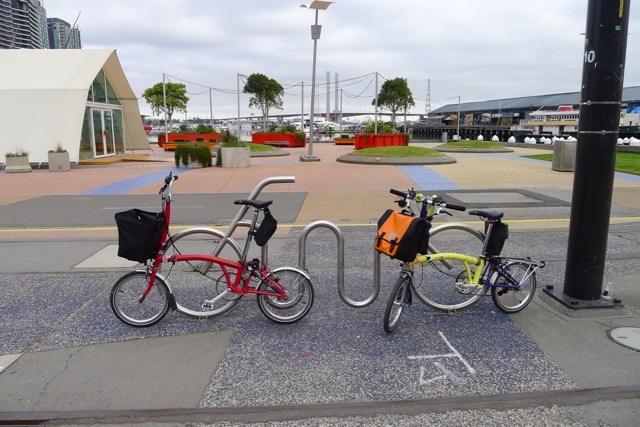 I lived in London 2005-2010 and bought a Brompton in 2009 and bought it back to Melbourne with me. Quite a cult bike in the UK and Europe more broadly! 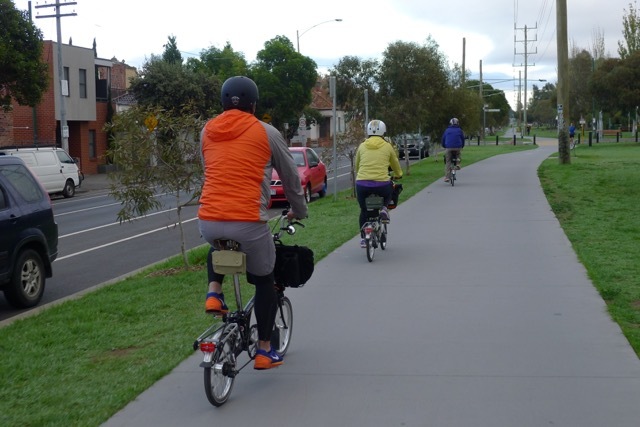 I would be interested in knowing more about the Melbourne Brompton Club. Lovely to hear from you Denis! Hi Dayna, no, I am not on Facebook. Any other link? Having been fascinated with Australia since my parents nearly emigrated in the 1950s, it is a pleasure to read about ordinary, everyday life. How often I have wished that they had actually emigrated. Thank you for the compliment to Australia, Elena. Sometimes we Aussies do tend to forget just how good life is in the ‘lucky country’. But while it is important to recognise the good things you have in life, it’s equally important to strive to be better. No country is perfect. France is really very nice, and so are the people, so I have absolutely nothing to complain about. I was sort of on my way to Australia when I left England, but I ran out of money for the really big adventure to the other side of the world. May be one day. Ah, money! Imagine where we’d be if it didn’t exist! “Unhurried” makes for some beautiful riding Dayna. 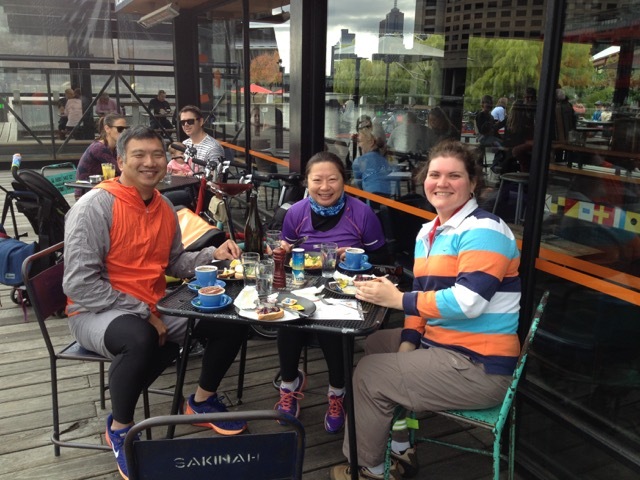 And it’s so good that you toured around the streets of Melbourne on your Bromptons – apart from the “bear-ish” character – as there are probably many people who’s interest was piqued by seeing your Brompton crew having such a great time cycling. Thanks for reading Gail. I haven’t participated in a group ride previously, so I have to say my first experience has not let me down! Hi Mick, nice to hear from you! It took a couple of attempts, but now we’re full steam ahead with a ride at the end of each month.